To provide opportunities for community members to learn about and discuss relevant and current international issues. International night is a speaking event held multiple times each year. During the event, a guest speaker gives a talk about a current international issue or event. On December 2, 2017 SHARE hosted our Open House as a way to conclude all of the work we have done throughout then year. Interns, board members, family and friends came to the SHARE office to enjoy a morning full of international cuisine, and desserts while discussing which projects we've funded. We love to speak about our garden and prospecting projects we look forward to fund in the near future. 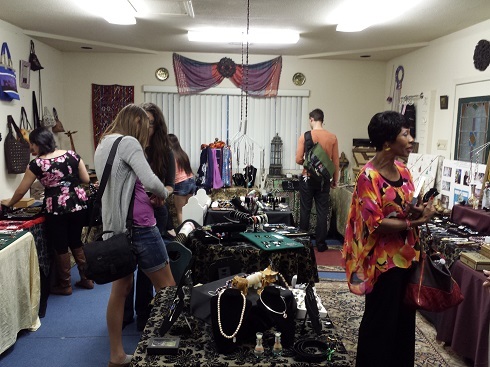 During this time we open up our jewelry room for sale and award our scholarship recipients. SHARE hosted seventy students and members of the community at International Night. Mr. John Hess spoke about the "Importance of Travel." The presentation lasted for an hour and a half. Participants enjoyed a dinner consisting of ethnic foods. On March 15, 2018 SHARE hosted our International Night, with a focus on our Domestic Projects. We had two interns give a power point presentation on the 2018 New Orleans Trip, as well as a presentation from Chris Nelson who is the pilot for our Flying Samaritans project. Guests also had the opportunity to delight in Egyptian/Afghani food and browse our jewelry room. On October 12, 2017, Ms. Ronda Mills came to SHARE to discuss environmental issues affecting humans, as well as careers in environmental science. Dinner and dessert was served to those in attendance, and some of the the interns aided in selling items from our jewelry room. International Night was held on October 9th at the SHARE Institute. The night featured dinner and presentation on “Eastern Europe: An Update.” The talk featured Dr. Soheir Stolba and Dr. Kathleen Collihan discussing the current political, economic and social issues in Eastern Europe, including the affiliation with the European Union. Visitors enjoyed a nice buffet dinner. International Night, held on March 7th at the SHARE Institute, featured an internationally themed dinner and presentation by Dr. Soheir Stolba entitled “Ecuador: Tradition and Modernization.” Dr. Stolba spoke about her latest trip to Ecuador and the current political and economic issues facing this country. The presentation included many beautiful photos and a fascinating discussion between Dr. Stolba and the guests in attendance. International Night, entitled “The role of non-governmental organizations in Development,” was held on February 24th and featured a delicious internationally themed dinner, a slide show presentation and a talk. Dr. Soheir Stolba spoke about the importance of non-profit organizations in global development as well as the challenges faced by small non-profit organizations. Afterwards, Ms. Jessica Buchanan discussed her experiences as an intern for SHARE, the international experiences she has gained through this internship program and the opportunities that opened up to her as a result. 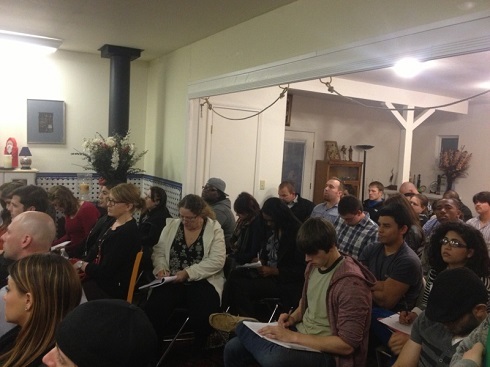 Over sixty guests attended this event to learn about non-profit organizations and their impact on the developing world. International Night, etitled “The Role of Non-Governmental Organizations in Development,” was held in early October and was a huge success. Over one hundred people attended the event. A delicious ethnic feast was prepared and served to guests and jewelry from around the world was availible for purchase. The President of SHARE, Dr. Soheir Stolba, spoke on the topic of “South Sudan: Opportunities and Challenges.” The attendees thoroughly enjoyed learning about this new country. In March of 2011, Lauren Herman discussed the time she spent in Kenya during the summer of 2010 and winter 2011. She discussed her role in the establishment of a micro-credit project with a SHARE partner organization in Kenya as well as the challenges she faced in the implementation of this project. On February 17, 2011, Dr. Soheir Stolba, the Executive Director of the SHARE Institute, spoke about the recent political events in Egypt. Over 95 people from the Sacramento community attended, including students and professors from local colleges and universities. The SHARE Institute hosted a dinner and International Speakers’ Event entitled “Will Sanctions Work? The Case of Iran.” The presentation was given by Mr. H.J. Whitaker, a veteran international consultant who has worked many years in Iran. Mr. H.J. Whitaker discussed the current domestic and international policies of Iran and the role these issues play in Iran’s nuclear program. Mr. Whitaker also discussed how US international policy plays a crucial role in these issues and the possible implications surrounding international sanctions being placed on Iran. 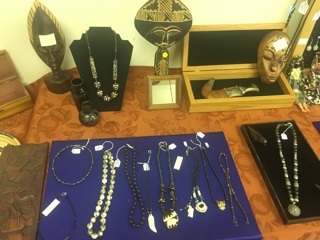 During the event, SHARE’s interns kept busy assisting our guests, showcasing SHARE’s collection of jewelry from around the world, and providing the background support necessary to ensure the event was a huge success. At the end of the night, attendees gathered back at the SHARE office to discuss the presentation and to enjoy some delectable desserts made by the interns. In April 2009, The SHARE Institute hosted a dinner and International Speakers’ Event entitled “The Role of Women in African Politics and Development.” The presentation was given by Dr. Winsome Jackson, a professor and chairperson of the Political Science Department at Sierra College. Dr. Jackson travelled to Africa to reseach the roles of women in politics and development, interviewing women in various positions of government in Ghana, Tanzania, Botswana, and Rwanda. Dr. Jackson’s presentation for the evening focused on her findings from Rwanda, though she also discussed some of her findings from the other countries she visited. The event was immensely successful, and Dr. Jackson’s presentation was highly praised as being both informative and insightful. During the event, SHARE’s interns kept busy by managing the crowds, showcasing SHARE’s collection of jewelry from around the world, and maintaining order amongst the chaotic food rush in the kitchen. At the end of the night, attendees gathered back at the SHARE office to discuss the presentation and enjoy some delectable desserts made by the interns. On March 5th, 2009, Dr. Soheir Stolba and Dr. Rudy Pearson, history professor at American River College, hosted a talk entitled Progress in East and West African Countries: An In-Depth Look at Kenya and Ghana. The presenters discussed the current social, economic, and political progress within both countries. They also elaborated on various regional differences between the two countries. On November 20th, 2008, Dr. Soheir Stolba, President of The SHARE Institute, presented a talk entitled The Women of Afghanistan Today. Dr. Stolba gave a well-rounded discussion on the current status of women in Afghanistan utilizing current academic research, personal experiences in Afghanistan, and project reports from SHARE’s work in the region. The talk was well attended by SHARE supporters. The SHARE Institute was proud to welcome the founders of Compas de Nicaragua, Michael and Anna Bourdreau, as speakers in our international speaker’s series. They shared their experiences of running a non-profit organization in the poor settlement of La Primavera located in the capital city of Managua. Compas de Nicaragua offers programs through Women in Action, an organization that formed against incredible odds to answer the needs of the community. Forty women currently participate in the programs that focus on community health and nutrition, provide educational opportunities, and help improve sources of income. Some current activities include gourd art that can be sold on the streets, soy production that is used as a healthier and cost efficient alternative to rice and beans, and preserving cultural traditions through dance presentations. In addition, Women in Action also teaches women to become self-reliant through educational programs and workshops. Compas de Nicaragua and The SHARE Institute have teamed up to offer internship opportunities for students to visit and work with Women in Action. These trips allow interns to experience the living conditions of extreme poverty and to make a difference in the lives of these women and their families. Vietnam in Transition: Over the winter break, Dr. Stolba was able to visit Vietnam and experience the country’s beauty first hand. She brought back with her pictures, clothes, and heart wrenching experiences. She was able to visit and fund four new SHARE projects in Vietnam, including a woman who takes care of those suffering from HIV/AIDS. In March, SHARE held a panel to discuss Iranian politics. The evening was opened up by Mr. James Whitaker’s explanation about the current political climate in Iran. Mr. Whitaker’s expertise came from his first-hand experience working for the Peace Corp and being an international consultant in Iran. He discussed Iran’s intentions and how much of a threat they pose to the United States. Ms. Leva Ahmadi focused on women and human rights issues. This was followed by a discussion where the audience interacted with the speakers. SHARE hosts once a month a presentation where the public is invited to taste ethnic foods and participate in discussion on topics of interest. The two recent topics have been “Current Events in Somalia: An Update” and “Afghani Women’s Issues: An Update.” In addition, Dr. Soheir Stolba, President of the SHARE Institute, gives presentations to civic groups and universities in and surrounding Sacramento areas. Call the institute for reservations. International Night, Hosted by Dr. Soheir Stolba, was entitled “Change in South Africa.” Professor Rudy Pearson, a history professor at American River College, showed an in depth Power Point presentation of his recent trip to South Africa. Ms. Heidi Lidgett, an associate of the SHARE Institute gave a presentation showing 40 children for whom SHARE provided food and supplies. She also spoke of the progress the children have made and her plans for the future. The Angel Care Center is in South Africa. It provides education, food, and simple medical care to orphaned children suffering from AIDS. The second International Speakers event, “Democracy in the Middle East,” was presented by Dr. Soheir Stolba and Professor Kathleen Collihan of American River College. They spoke of the qualifications of democracy and the adaptations to new systems of governance. Topics covered were elections in Egypt, Iran and Iraq and the new Iraqi constitution. A lively discussion followed their presentation and an informative time was had by everyone in attendance. 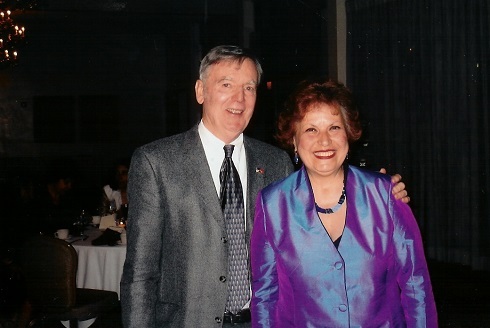 Dinner and Dialogue is held once per year. 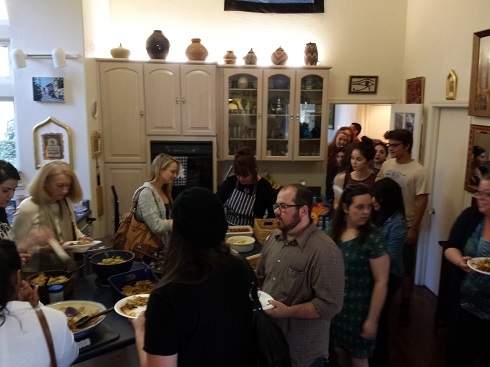 SHARE supporters gather to eat a meal together and discuss current international events. Several guest speakers present on a topic of their expertise, followed by an open discussion. This event provides participants with the opportunity to interact with experts in the field of development. In March, Dinner and Dialogue was held. The topic was The Middle East: An Update. More than 30 guests attended this elegant event featuring five experts on Middle Eastern Issues. Winter Open House is held once a year on the first Saturday of December. The open house provides SHARE supporters the opportunity to browse through SHARE’s project albums and brochures. The SHARE Boutique is also kept open so that patrons may purchase unique gifts from around the world to help support SHARE’s International and Domestic programs. Dr. Stolba’s famous Somali tea is served throughout the day, along with other light refreshments. This event is also the only time during the year when Dr. Stolba has her Somali tea available for purchase. This year, SHARE’s Winter Open House included a brunch and fashion show. The fashion show featured styles from around the world modeled by SHARE Interns. The funds raised during this and other events go toward supporting SHARE’s initiatives worldwide. The SHARE Institute held an Open House in the month of December. Many of SHARE’s supporters and friends gathered to enjoy the holidays and partake in the jewelry sale that supports the mini-grants. The Open House ended with a small party honoring the fall interns who have worked very hard to make all these programs possible. The Spring Hike, held most years during the spring, is a SHARE sponsored trek through the Sierra Nevada foothills. Hikers are provided with box lunches and the opportunity to chat with one another about global issues. In early spring, 2009, SHARE sponsored a spring hike through the foothills of the Sierra Nevada. Hikers enjoyed the great outdoors and a box lunch created by the interns of the SHARE institute. The hike was a great success among participants, all of whom put their best foot forward to help The SHARE Institute. On February 13th, 2009, the CSUS Women’s resource Center in collaboration with The SHARE Institute, My Sister’s House, Soroptomists of Sacramento, and the Visiting Scholars Program, hosted the 5th Annual International Dialogue on Violence against Women. The topic of the day was “Human Trafficking: Internationally and In Our Own Backyard,” and the speakers included Dr. Soheir Stolba, who talked about issues of trafficking in Vietnam and Nigeria, and former SHARE intern and Zimmermann Fellow Aashika Damodar, who discussed her most recent ethnographic research on human trafficking. The conference was a tremendous success, attracting many participants and attendees from around the world. A big thank you goes out to the CSUS Women’s Resource Center for working so hard to make this a success year after year! 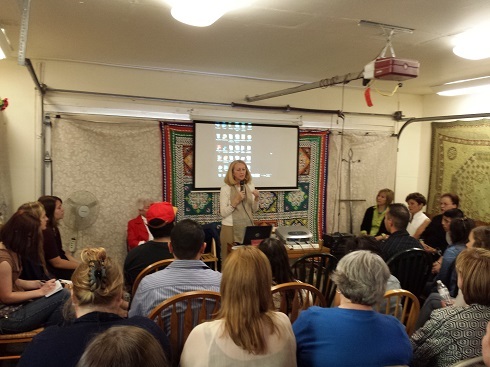 the SHARE Institute held a conference at Sacramento State University entitled, “War, Women, and Violence; Perspectives on Recent Events in the Middle East.” The conference included a variety of lectures on different Middle Eastern countries, including Lebanon, Israel, Iraq, and Afghanistan. The first topic of the conference was the Israeli-Lebanese conflict. Next, the crisis women face in post-war Iraq was discussed. The third speaker, an American Afghani journalist, spoke of her personal experiences with women and violence in Afghanistan under the Taliban rule. During this time of oppression, women were scared into obedience, forced to wear burkas, denied an education, and secluded to their homes. Dr. Soheir Stolba had a busy semester giving talks around the community. In February, Dr. Stolba addressed the topic of Middle Eastern women’s issues at American River College. In March, she spoke in Yuba City concerning what it was like to grow up in Egypt. In April, Dr. Stolba held a discussion at CSUS about the crisis in Darfur. Africa Day: The last SHARE event of the semester was infused with food, music, African fashions, great speakers, and henna. The discussion panel focused on the current problems and opportunities facing Africa today. Dr. Stolba began the discussion with the crisis in Darfur, Sudan. Next, Mr. Moses Nijuki, a Ugandan, spoke on the conflict of interest between the Ugandan government and the Lord’s Resistance Army, a group fighting for political power. Following was Ms. Judy Odipo, who spoke on Female Genital Mutilation (FGM) in her home country of Kenya. She addressed the health dangers and mental repercussions of the procedure. Ms. Feryal Said elaborated on her first-hand experience of war in Somalia. The war-torn country has been in and out of military conflicts for the past decade. Overall, the event was a great success. India Day: On November 19th the SHARE Institute and Model U.N. hosted the second annual India Day at the ARC Ranch House. The event was designed to raise funds for TAPWA, a Tsunami orphanage in India. The children who will be housed at the orphanage lost their families in the 2004 Tsunami. Some of the highlights from the event included two traditional dance performances, a Dandia Raas (stick dance) in which attendees had the option of participating, and wonderful Indian food. There were also several booths educating attendees on the culture of India and the SHARE Institute. The event also included two speakers, Dr. Soheir Stolba and SHARE intern Aashika Domodar, who will visit the orphanage in India in December. The talk reflected on the Tsunami affected area and specifically the children who were orphaned. The event was a success and now Tsunami orphans will soon have a place to call home. The SHARE interns held an event at American River College to raise awareness about the tragedy in Darfur, Sudan. Funds were raised for women living in Darfur. The SHARE Institute and the American River College Chapter of Amnesty International held an India Awareness Day. 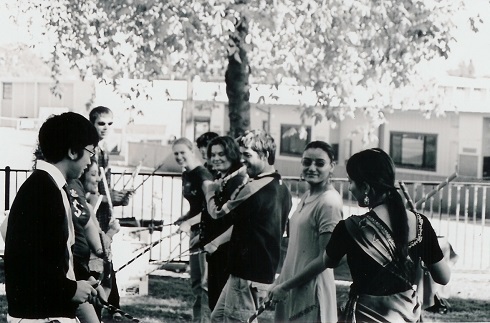 The day was dedicated to educating and increasing awareness about trafficking in women and children in India. The funds raised during the event were used to combat this type of slavery. The Caverna Event was a large community event held at Caverna 57 to raise awareness about SHARE’s projects and to raise funds to continue supporting those projects. Many community supporters, artists, interns and Board members attended this very successful event. The SHARE interns organized fundraisers and collected emergency supplies to aid the victims of the tsunami in India. With the help of the Sacramento Buddhist Temple, donations from SHARE were able to reach the different affected regions. The SHARE interns and volunteers made and sold over 500 samosas as a fundraiser for a deworming project in Nigeria. This project will be implemented through CHEDRES and will improve the health of 200 children. The SHARE Institute contributed to a campaign led by UCLA to fund preventative efforts against breast cancer. The SHARE Institute, along with interns, raised money for the UC Davis Medical Center to fund a program that purchases crafts and other entertainment items for adolescents enduring cancer treatments. The SHARE Institute sponsored a dancer in UCLA’s 4th Annual Dance Marathon to raise funds for HIV/AIDS awareness. The SHARE interns, along with American River College students, raised money for the well-being and education of Afghani women and children at the American River College campus. Food, jewelry, and other goods were sold, and a raffle was held to raise funds. Interns and volunteers also educated students about the conditions of women and children during war. The SHARE Institute, along with a California elementary school teacher, helped to establish a student led fundraiser to benefit Afghani children. Popsicles were sold at the school’s March-a-thon, an event where students walk laps around a track to raise money for school projects. The “Adopt-a-Classroom” project was also started. This project allowed students from the school to communicate with other students in Afghanistan via e-mail. A SHARE intern raised funds for a project in South Africa implemented by The Angel Care Center. The funds were used to provide nutritious meals for street children. The Angel Care Center also provided clothing, temporary shelter and an education and development program.